I just re-watched Miyazaki’s version of Diana Wynne Jones’s Howl’s Moving Castle, and it’s churning up this strange and unwilling fondness for anime in me. (It did the first time too, but I dismissed it as an aberration.) Even though Miyazaki changed vast chunks of the plot, even though the characters have the giant eyes and tiny noses of anime that normally annoy me so much, and even though strange airships blimped around the entire time, I can think of few other book-based films which I actually liked enough to watch again. Certainly no comic or fantasy-based film has ever left me anything except indignant and nit-picking: there were always a million small things, and often some huge things, that rang clangily hollow. The only exception (Even movie-Watchmen‘s slavish adherence to all things except the giant squid seemed, somehow, to lack the intense hysteria of the comic) is Sin City, which exactly replicated the filthy noir quality that I loved in the comics, where what you couldn’t see in the heavy darkness loomed large over what you did see. As with Sin City, the implication by enshrouding that there is an entire world that is new and strange to the reader seems to work very neatly in Howl’s Moving Castle. What happens, I suspect, is that animation has an abstract quality that makes it so much easier to watch and re-imagine in the watching than an actual film. So even though Calcifer the fire demon (for instance) didn’t look like the Calcifer in my head, he was an excellent abstract of said Calcifer-in-my-head. The whole realism thing is, of course, inherent to (non-cartoon) cinema, and perhaps I should stop watching altogether. Films are obsessed with maintaining the appearance of reality*. Any self-respecting film would try to show you what a Calcifer would look like if Calcifers existed in our world, bound by its optical laws. Except, in doing so, it misses the entire point of fantasy which is this: Calcifer does not and cannot exist in our reality. This is why he is a fantastic character. The only place where Calcifer exists and should exist, is elsewhere. This is why however magnificent FilmAslan is, he is still just a regular, if largeish lion, prancing around on screen. 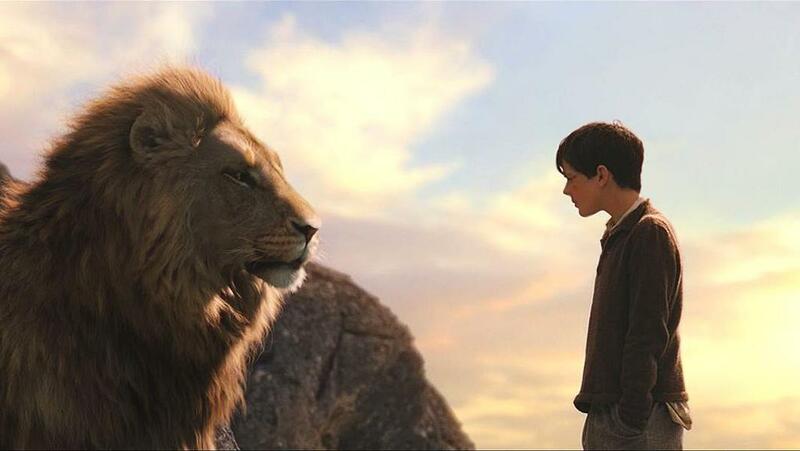 In making him realistic, most of the abstract qualities that hover around BookAslan (Aslan as stand-in for god, Aslan as inherently just, and Aslan as inherently unknowable) are obliged to go away, because there is no visual way to portray them realistically, and even swelling orchestral soundtracks can only do so much. Animation is, for me, particularly suited for rendering fantasy, because of the fact that it works with symbols and metaphors, rather than representations of reality: it gives you rough ideas, but the actual work happens in your head – as it should, to be truly fantastic. Anyway. Back to Miyazaki. The characters are all very nicely distinguished, in the way they speak and move and hold themselves. Howl himself was completely unlike the way I’d imagined him, with his strange air of vulnerability. I liked, too, the way that it was his body that was the site of desire, not hers: both YoungSophie and OldSophie are more or less shapeless, wrapped up in stout shoes, layers of petticoats and voluminous gowns, while Howl’s body is depicted in slim, delicate lines. It’s Howl who is so obsessed with his own attractiveness that he sobs himself into a pool of green snot when his hair turns orange; later, he wanders around in a towel that slips coyly off, and it’s Sophie who determinedly does not to ogle. Howl’s vulnerability is constantly in play, in his repeated exhaustion, and the increasing frailty of his bird-form. In contrast, Sophie, even when aged, is satisfyingly solid. She is bursting with determination and stamina: she stomps determinedly up the very long and steep palace steps carrying a dog, even taking the trouble to pep-talk the Witch of the Waste through the climb; she cleans constantly, and she looks after all the other characters. Though Sophie’s degree of agedness careens wildly, and though she is voiced by two separate actresses (one for young and one for old Sophie) she is somehow tangibly always the same person: its her persistent vitality that holds the whole story together. The war scenes combine just the right amount of realism (the blimps and the images of burning buildings are realistic in content, though not in form) and pure comic-ness (by comic-ness I do not mean comedy: I mean the quality of being a comic) as when the blimps have wings and let loose strange annoying giant insects, along with their bombs. The fact that none of this is actually in the book, made little difference: it is still a beautiful, intuitive and thoroughly original film which somehow manages to be Howl’s Moving Castle, in addition to all the other things it is. So yes, I take back many of the uncharitable things I may have said about anime in the not-so-distant past. It can pretend to be as cutesy as it wants: now that I know that it’s secretly all sharp steel and strange flourishes underneath, I won’t be fooled again. Sometimes, anyway. *Even Bunuel and co could only manage to show us what would happen if our reality was a bit more fluid and random than it is. It was still, quite clearly, our reality – our pebbles and eyes and people and scorpions. Sometimes dreamlike, but never entirely other.